Some argue that minimum wage hikes cause labor crises  or recessions  . Is this true? This graph is at first glance highly persuasive. But then I realized the graph plots the minimum wage divided by the average level of compensation, so it’s tracking a ratio. Hence, average compensation (which declines during a recession) is also imparting some of the movement in the ratio. 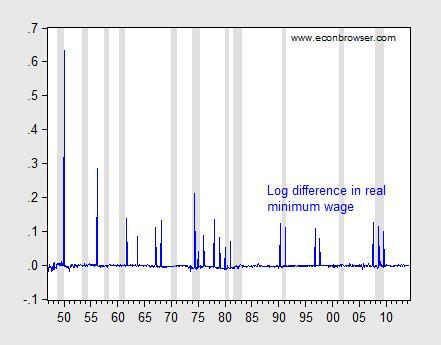 That prompted me to wonder what minimum wage increases look like in relation to recessions. Here is the relevant graph. 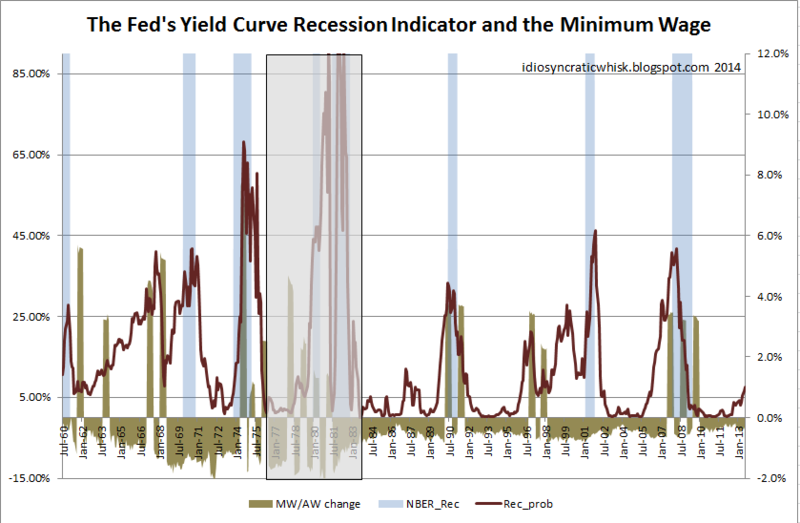 Figure 1: Log first difference of real minimum wage (blue), and NBER defined recession dates (shaded gray). Deflation uses CPI-all. Source: BLS, NBER, and author’s calculations. It certainly seems like plenty of recessions don’t follow increases in the minimum wage. But to test formally, I undertake some Granger causality tests (remembering that Granger causality is merely temporal precedence). Using four leads and lags, I find that I can reject the null hypothesis that recessions do not cause minimum wage changes, at the 10% significance level. On the other hand, I cannot reject the null hypothesis that minimum wage increases do not cause recessions. What about the weaker proposition that minimum wage increases induce noticeable decreases in employment? The Employment Policies Institute (not to be confused with the Economic Policy Institute) has been a vociferous advocate of this view. A recent study by Professor Joseph Sabia  documents negative impacts of minimum wage increases. I have repeatedly asked for Professor Sabia’s data set in order to replicate his results, to no avail. Using the Meer and West dataset, I have found little evidence of the purported negative effects (see here). However, the Meer and West dataset is freely available, and anyone with the requisite skills can replicate my results.